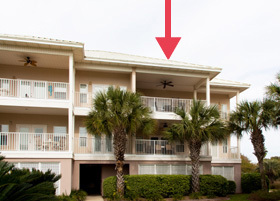 Welcome to Destin Palms, Vacation Rental Condo! If you are looking for a spacious, ocean view condo for your next family vacation to Destin Florida, this is it! With so much to offer, you will be thrilled you picked "Destin Palms" located in Pavilion Palms. Ocean views, large balcony, private garage, 3 large bedrooms, fully equipped condo, plus more. Please view our site here and be sure to view our gallery of photos to see all we have to offer. Book online or contact us with any questions. We look forward to having you stay with us at Destin Palms. We do have an ocean view from our spacious balcony, living room and master bedroom. 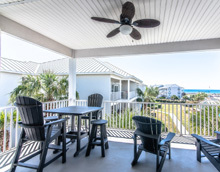 Enjoy a morning cup of coffee on our balcony with the view of the blue skies over the Gulf of Mexico. 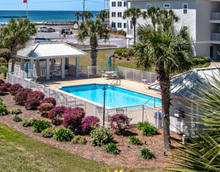 The public access for Miramar beach is located directly in front of our Pavilion Palms Condo complex. 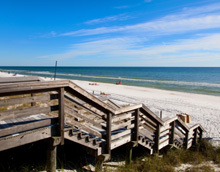 It is a short walk to the white sandy beaches of Destin Florida. The community pool here at Pavilion Palms. There are bathrooms and a shaded area for your use. The pool is seasonally heated and is located in the center of our complex. Our fully furnished condo is spacious with tall, 11 ft ceilings. 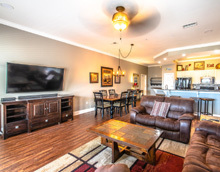 It is an open floor plan that has ample room for your family to enjoy a week in Destin Florida. Our location provides you a great ocean view and the privacy of not having anyone above you. This is a highly desired condo location.